The all-new olloclip Telephoto with Wide-Angle Lens + Circular Polarizing Lens (CPL) has been completely redesigned for the iPhone 6/6s, and 6 Plus and 6s Plus. The precision design delivers a 2x optical magnification, allowing you to get twice as close to your subject- while the removable CPL reduces glare and reflections and makes colors look rich and true to life. The added All New Wide-Angle Lens is perfect for when you need that extra field of view, approximately double that of the normal iPhone. Our pocket-sized, patented design now works on both front and rear-facing cameras. Plus it comes with 3 wearable pendants, because the best camera is the one that's always with you. 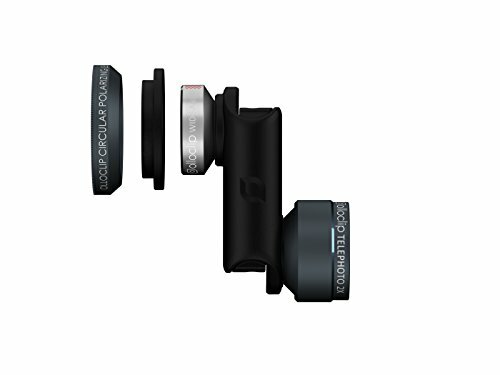 If you have any questions about this product by Olloclip, contact us by completing and submitting the form below. If you are looking for a specif part number, please include it with your message. Google Pixel Case with Wide Lens Kit || Moment Walnut Wood Photo Case plus Wide Lens || Best google wide attachment lens with thin protective case.